Western blot analysis of extracts from K562 cells treated with EGF 200ng/ml 5', using p70 S6 Kinase beta (Phospho-Ser423) Antibody. The lane on the right is treated with the synthesized peptide. Immunogen The antiserum was produced against synthesized peptide derived from human p70 S6 Kinase beta around the phosphorylation site of Ser423. 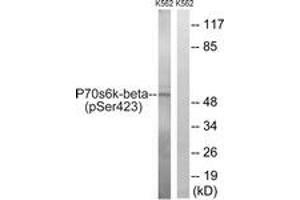 p70 S6 Kinase beta (Phospho-Ser423) Antibody detects endogenous levels of p70 S6 Kinase beta only when phosphorylated at Ser423. 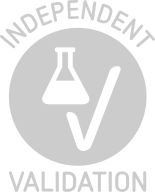 Purification The antibody was purified from rabbit antiserum by affinity-chromatography using phospho peptide. The antibody against non-phospho peptide was removed by chromatography using corresponding non-phospho peptide. Background publications Lee-Fruman, Kuo, Lippincott, Terada, Blenis: "Characterization of S6K2, a novel kinase homologous to S6K1." in: Oncogene, Vol. 18, Issue 36, pp. 5108-14, 1999 (PubMed).